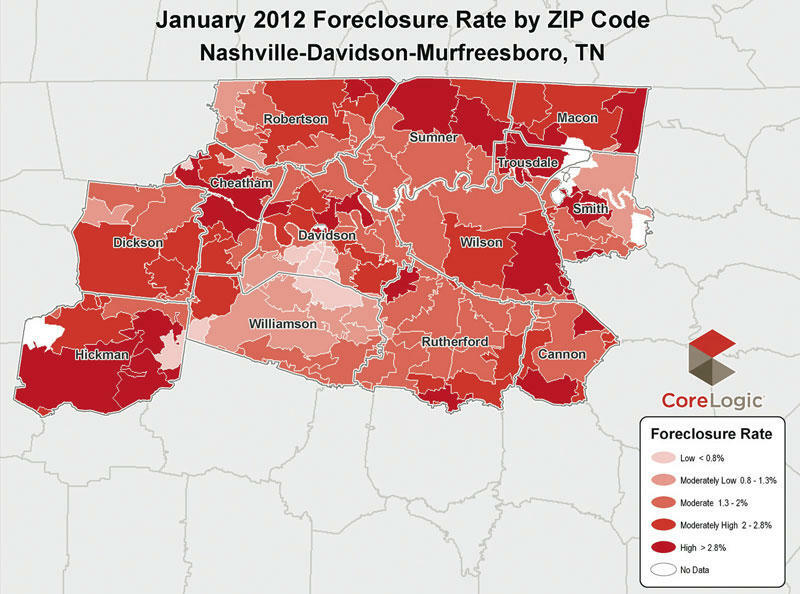 Foreclosures in Middle Tennessee have decreased recently, reflecting a nationwide trend of slowing foreclosure rates, newly released data shows. On Thursday, CoreLogic, a provider of information, analytics and business services, released its National Foreclosure Report for February, which provides monthly data on completed foreclosures, foreclosure inventory and 90-day-plus delinquency rates. The data reveals the rate of foreclosures among outstanding mortgage loans in the Nashville-Davidson metropolitan area and the cities of Murfreesboro and Franklin is 1.73 percent for the month of January – the most recent data available. This figure represents a decrease of 0.23 percentage points compared to January 2011, when the rate was 1.96 percent. Foreclosure activity in the greater Nashville area is lower than the national foreclosure rate, which was 3.43 percent for January of this year. Also, the mortgage delinquency rate has decreased. According to CoreLogic data, 5.50 percent of mortgage loans were 90 days or more delinquent in January, compared to 5.73 percent for the same period last year, representing a decrease of 0.23 percentage points. There were approximately 65,000 completed foreclosures in February, compared to 66,000 in February 2011. In January of this year, there were 71,000 homes that were foreclosed on. From the start of the financial crisis in September 2008, there have been approximately 3.4 million completed foreclosures. “The pace of completed foreclosures is down slightly compared to January, running at an annualized pace of 670,000, but compares favorably to the pace of completed foreclosures in February a year ago,” said Mark Fleming, chief economist for CoreLogic. Fleming said even though the pace of completed foreclosures has slowed, the overall foreclosure inventory is decreasing because real estate-owned sales were up in February. “With the spring buying season upon us, the inventory may decline further as the pace of distressed-asset sales rises along with the rest of the housing market,” he said. More than 60 major markets experienced a decrease in foreclosure rates in February compared to a year ago, said Anand Nallathambi, president and CEO of CoreLogic. “This combined with faster clearing rates, better employment news, and continued historically low interest rates are all positive signs of improvement in the housing economy,” he said. One organization is helping struggling homeowners avoid foreclosure through funding by the U.S. Treasury Department. NeighborWorks Alliance of Tennessee was able to keep nearly $47 million worth of mortgages out of foreclosure and 393 unemployed or underemployed families in their homes in 2011 by offering access to the Hardest Hit Fund. Several hundred more families were helped through mortgage mitigation, the organization announced. In 2012, the Alliance will continue to offer these programs. The Hardest Hit Fund has been expanded to provide up to $5,000 in additional benefits to each homeowner. The program is funded by the U.S. Treasury and administered in the state by the Tennessee Housing Development Agency. The nonprofit Alliance then connects homeowners in need with those funds. Of all the organizations offering access to the payment program in 2011, the Alliance accounted for more than 40 percent of the assistance provided to Tennesseans. In 2012, qualified homeowners in all Tennessee counties could receive benefits up to $20,000 to cover up to 12 months of mortgage expenses. In 29 counties identified as the most heavily impacted by the recession, homeowners may be eligible for up to $25,000 to cover up to 18 months of expenses. “(Last year) was a difficult year for many and with the slow recovery, 2012 could be equally tough for many Tennesseans,” said Eddie Latimer, CEO and founding director of Affordable Housing Resources, the Middle Tennessee member organization of NeighborWorks Alliance of Tennessee. “We are extremely proud the Alliance was able to help so many deserving Tennesseans stay in their homes and hope we can help many more in the coming year,” Latimer said. A consortium of nationally chartered, Tennessee-based housing nonprofits, NeighborWorks Alliance of Tennessee provides a range of free mortgage services to help Tennesseans seek solutions to pending foreclosure in addition to the federally funded mortgage payment assistance.